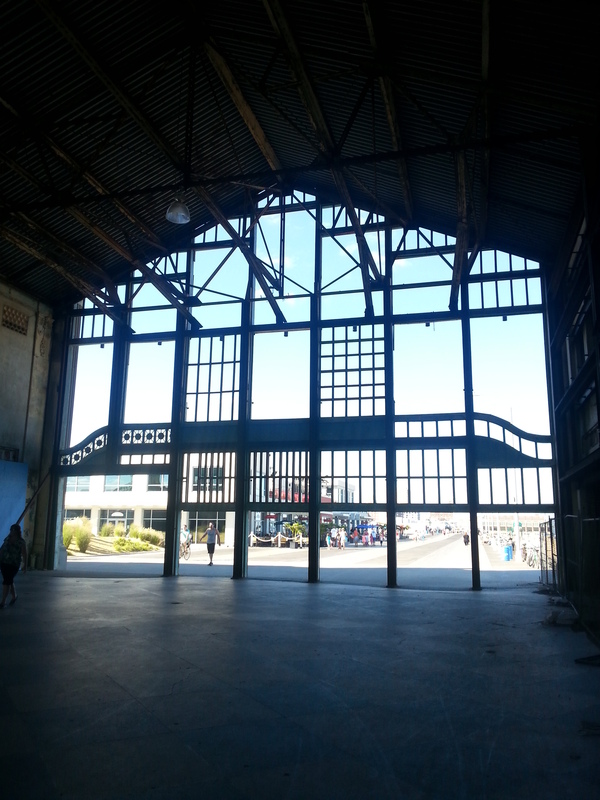 Finally made it to recently refurbished Asbury Park last week. The revitalization process of this one-time East Coast resort is still in progress. Revitalization on many levels got underway in 2002. Quick fact: At the onset of the previous century, Asbury Park’s only competitor in the beach resort department was Atlantic City. Quick fact: Musicians Bruce Springsteen and actor Danny DeVito hail from Asbury Park. Quick fact: The very cool Stone Pony venue is opposite the boards on Ocean Avenue. Bruce Springsteen—with his E-Street band, featuring the awesome (but late) saxophonist Clarence Clemons—rocked that watering hole on many an occasion. 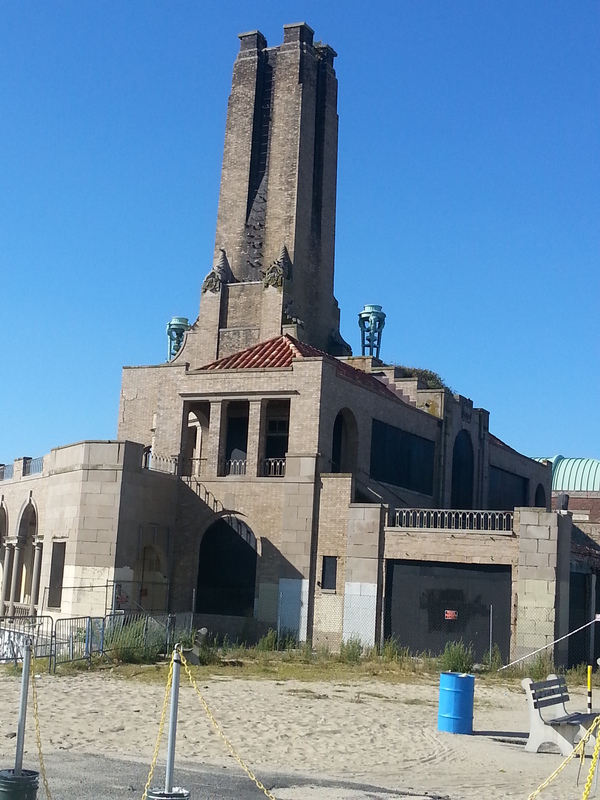 Find more detailed history on the origins and development of Asbury Park here. (It’s pretty cool.) The opening of the Garden State Parkway led to fewer folks needing to take a train to the beach. Legalization of gambling in Atlantic City took a lot of the traffic too—at least, that’s what Hubby says—and the addition of Sixx Flags Great Adventure Theme Park didn’t help the Asbury Park cause either. I’ve supposedly been there as a kid. I’d be lying if I said I remembered. Inside the Casino walkway –photo by Hubby. Hubby suggested Asbury Park. Since I hadn’t been near it since my fifth wedding anniversary (that would have been April 29, 2000), I jumped at the idea. I love a place that offers something new I can learn. Yes, I’m nerdy like that. How awesome is this mural lining the Casino walkway? The lady might have been painted 5-6 years ago. A I found it quite impressive. The entire scene—including the ride—changes flavor frequently. One goes from the parkway to the state highway to the main drag, which isn’t necessarily the prettiest of places. Ocean Avenue, however, has been cleaned up. (So has the beach, beautifully so, compared to how it looked the last time I went.) Several of the original buildings and hotels have been restored, or restoration is in progress. 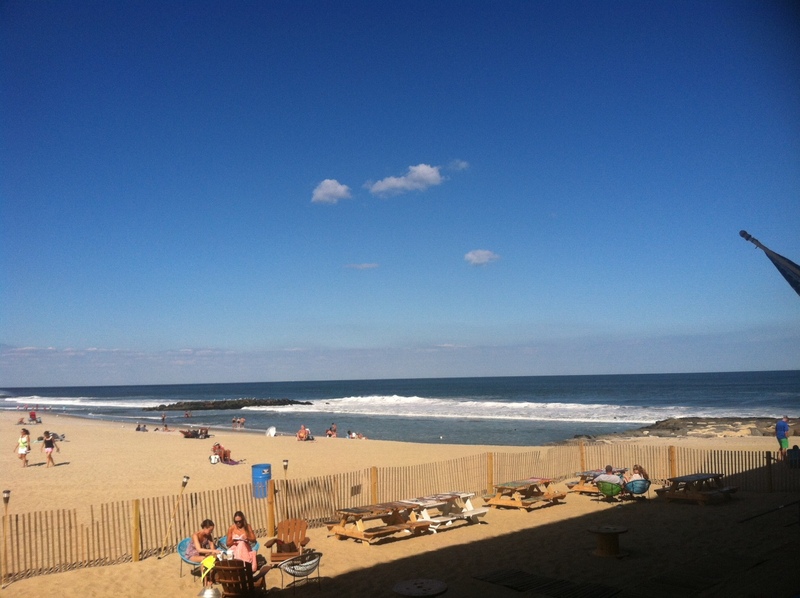 I took this photo from the north side of the restaurant overlooking the beach. Nothing relaxes me more than sitting on or near the beach when the PM breezes come in off the ocean. Restaurants that are open to the water—with sheltered dining available should the weather dictate—are on opposite outside walls of the mall. I thoroughly enjoyed sitting on the north end, at a wooden table made from an industrial electrical wire spool, sipping from Hubby’s drink while overlooking the Atlantic. View the convention center and theater and its outdoor seating area. View the inside the convention center, aka, the arcade. Asbury Park wasn’t terribly crowded. Granted, it was a Thursday. Hubby made some good points about why the area isn’t the best for the comeback the city hopes to make. The boardwalk, taken from the Casino, which faces the north side. Think the guy on the bike–with the six-pack–posed? (1) There are no amusements (i.e., rides or stands)—on the boards or in the immediate area—at present. (BTW, the original carousel was sold and currently resides somewhere in Myrtle Beach.) A sprinkler park, mini-golf and a store that offers crafts-for-a-cost (i.e., sand art, pottery, etc) seem to be the most entertainment for parents with younger children. Carousel’s housing. Although empty, it has been refurbished and occasionally used by theater group(s). Note: When Hubby and I brought my stepsons here, this structure had been turned into an indoor skateboarding park. Planks everywhere and a kid charging $8/person to use it. Innovative, but creepy to hear a thunder-like sound coming from inside there in a relative ghost town. On the plus side, Asbury Park is RIFE with history and nostalgia invoked because of the preservation of its many original structures and images. One can easily imagine what it was. With a little effort and some amusements, I believe it can prosper, especially with local traffic. (I heard its downtown district is getting a shot in the arm too. That can only help.) It’s a place where I enjoyed a few hours. I definitely might not mind spending a day, or even a weekend at one of the restored hotels. Chances are, I’d wind up writing about it some more. The heating plant, designed to provide heat for winter activities at the resort’s Casino and Carousel, assuming I read the articles correctly. These were designed by the same team who designed NYC’s Grand Central Station. Sorry I got a little long-winded, but thank you for indulging me. As someone who has some trouble letting go, I love the preservation of times past. ← Indie Author Jennifer Jensen Joins Us Today! What a shame such a lovely area has gone to such disrepair. Can there be enough open spaces (Canada included) where people can WALK around and enjoy the air and each other. Sigh. The bigger fish come along and gobble up the smaller ones–all in the name of big business. Such a shame. I hope the park will become vitalized again. 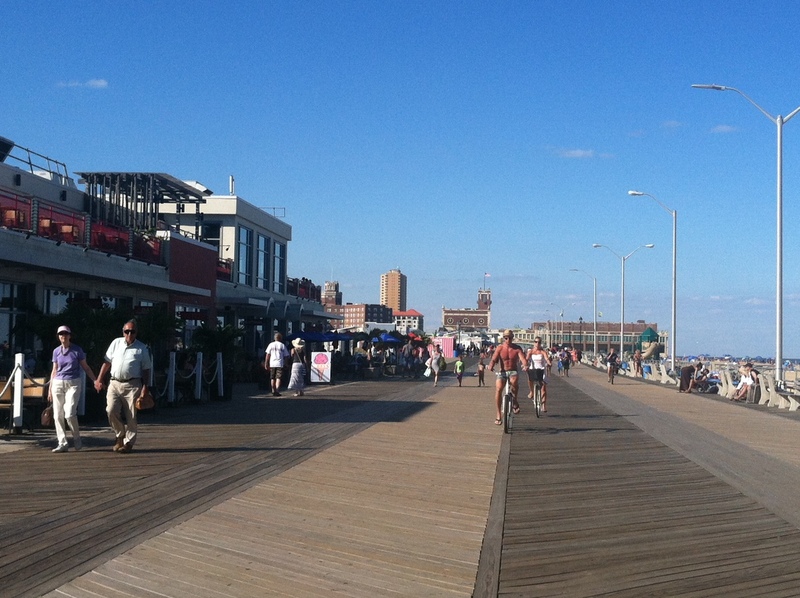 That’s pretty much what the boardwalk is right now: open air and people enjoying each other. The surrounding area is still a work-in-progress. If downtown gets a good shot in the arm, I wouldn’t discount an improvement. Doubt it can ever be what it once was. As you can tell, I’ve been a bit taken with it since this past Thursday. Spent an hour reading up and ‘visiting’ the Palace Amusements Online Museum. Despite lobbying and a whole lot of other hoopla, that was demolished. Sad. Sounds like Asbury Park was a great place. Hopefully it can find new life. Hard to believe it’s September already. I’m not ready to let summer go. I’m never ready to let summer go. I’m not a fan of winter, though I don’t hate it. Fall is lovely, but winter follows it. I live for spring and summer. 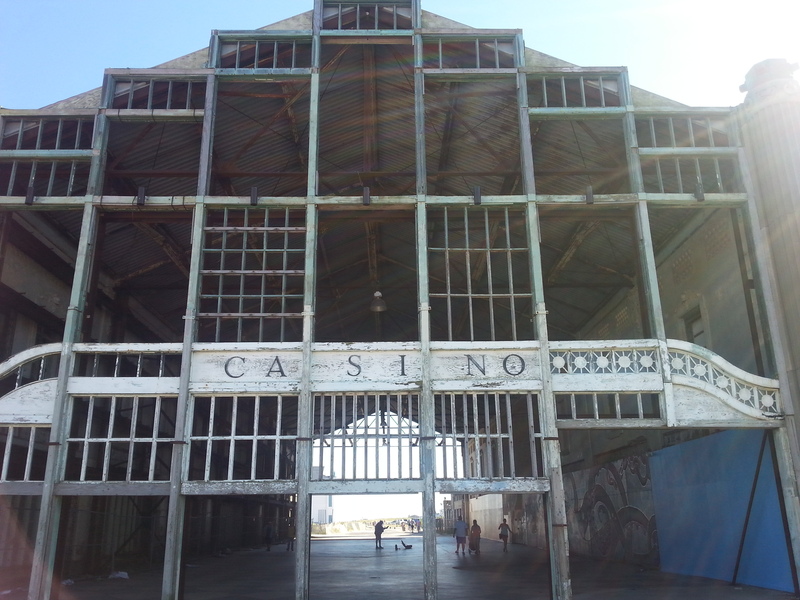 Hopefully, Asbury Park will find new life. It will definitely take time and a lot of cash.